It's been difficult for me to work up the desire to write blog posts lately because I just don't really have much to say....Or I have too much to say and I don't know how to organize it all. Over these past few weeks since Vienne's birthday, I have grown quiet...introspective, yet detached. As I have said before, it is easier for me to stay this way - clenched up in a nicely controlled little ball. But, remaining this way has not served me very well. Internalizing my emotions has unfortunately led to some health issues that I have just been diagnosed with. Celiac Disease. Leaky Gut...to name a few. As we all know, stress goes to the gut. But, don't worry about me - I've got a treatment plan going. I have been hit with so many tummy issues over my adult life that this is nothing new to me. I almost expected to get sicker from my grief and my stress. Anyway...back to the title of this post. I have collected a few lessons over these months. Small lessons for myself, as one who is grieving and bigger lessons for those who are close to someone who is grieving. Overall, Mark and I have been VERY richly and, I believe, uniquely blessed by the abundant support that has been so generously offered to us, through this most unimaginable time. Really. Truly. It is obvious just from the response people had to participating in Vienne's Birthday celebration. HUGE. Though, from what I have learned by other grieving parents (a new "club" that I am now unfortunately a part of), this kind of support that we have received is rare. I don't know the "whys" and it doesn't really matter...but we are beyond grateful. For you see, support and love is ALL that a grieving person needs. I believe that is the big misunderstanding out there that those who shrink away refuse to grasp. ~Don't be afraid to ask for support and love. It sounds and feels desperate sometimes, but I have found that it greatly pays off to be open about my need for it. When I encourage friends that their little notes of love and reminders that they're thinking of me is so HUGE and helpful, I know that encourages them to keep it up. ~Be gracious to those who don't know how to act. I know, deep down, that those who are awkward with me are not trying to punish me. I know they are sad for me. And, I know that it will not encourage them to grow closer if I, in turn, punish them with guilt. ~There is a HUGE difference between gently encouraging people that their support is needed and begging for pity. Begging for pity turns people away. Begging for pity even turns me away. ~We have been turned off by counselors and mentors and such...who have not been down this path before. We have learned that we would like to develop a relationship with another couple (perhaps older) who have lost a child and are further down this path than we are. A couple who can mentor us...who really understands. I think an understanding heart far outweighs a "license" and a "title". ~Don't pull away. Plain and simple. Just don't. It will be noticed and it will hurt that person who is already suffering the most pain imaginable. ~Acknowledge their pain and their lost loved one. Ask them if they are comfortable talking about that loved one. The biggest fear of a parent who has lost a child is that their child will be forgotten...while everybody else's children get to live on. ~Please try to refrain from saying "I'm sorry, I haven't called but I don't know what to say" because what is really being heard is that your discomfort is more important to you than our pain. I should clarify that we do understand that you don't know what do say and it is ok to admit that...but don't pull away because of that! ~KNOW that there is NOTHING right to say and once you get over that, if you want to be a real friend, then just BE. Grieving parents don't need eloquent words...there is nothing that can be said to make it all right, ever. But, you can offer love. It's very simple and doesn't take much effort or thought. ~Here are some suggestions if you feel that you don't know what to do or say and have an inclination to pull away: Text little messages like: "I love you", "I am thinking of you today", "I am praying for you today", "You are heavy on my heart"...etc. Things you could DO: Drop off coffee; make a meal; bring over a potted plant; read their blog and let them know you are reading so that they know that you are there; send a card; send them a memory of their lost one in an email; ask if you could stop by to just give a hug. ~Reminders that they are not forgotten and that their loved one is not forgotten are the BIGGEST gifts that you can offer. Seriously. ~Try to be sensitive about making statements like "it seems that you have finally reached some peace or healing". If said in the wrong context, it makes us feel pressured. Today, we might be acting well or normal. But tomorrow could be another day. We need to know that we are safe to fluctuate from day to day. We need to know that there is not a time limit (even though our culture automatically and quietly puts one on us). When we receive statements like that, all we hear is relief from that person...relief that we might be getting better and therefore might be less sad to be around. So then we fear that our "sadness" is not tolerated the next time we feel it tomorrow. As I have learned, this grief path is constantly 2 steps forward and 5 steps back. If that makes any sense. In general, it is just best to NOT assume anything, best to not surmise anything, or assess...or give advice. I don't mean to be nagging or negative or accusing AT ALL. My true aim is to just be helpful. If you have been reading my blog regularly, then you have been offered the opportunity to glimpse into this journey that we are on and I know that it has helped many in learning how to "act" around someone else who is grieving. I am so thankful for that! This was just a small list of detailed advice that might further help with others that you may know who suffer, as well. I believe that learning how to appropriately be a support to someone who is grieving is something that EVERYONE in our culture needs to learn. It is so sad to realize how ignorant our culture really is to grief. Have you ever pondered that? This point was made so clearly to me when one of our pastors wrote this blog post about grief, as it relates to Good Friday. It was so poignant and well thought out. I could never put a finger on it until he bluntly pointed it out. Our culture does not tolerate grief. When you look at other cultures, though, you may witness how well grief is tolerated and supported and accepted. In other cultures, they wail openly and publicly, they tear their clothes, they wear black for a certain length of time, they encourage and support the grieving...etc. But we do not. None of that would be tolerated here...it would be shunned. In our culture, we are so fiercely afraid of death that we do not want to even acknowledge it. We hear of a sad death and some think or say "oh, I can't even go there...please stop talking about that..."..."that is too much for me...that is too sad...I don't like to think about those kinds of things". You know? And, so the one who is grieving and already suffering the most pain ever imagined, is now ostracized because we remind people of death. Sad, isn't it? In our society people are full of admiration for the bereaved who keep "a stiff upper lip" and behave "maturely". Even if this is not put into words, the implicit demand on people is not to let themselves go. This may well collude with the mourner's own defenses and increase his denial of a need to grieve. I must admit that I have very much experienced this. I am "so strong". So I better remain "strong" because that is, now, what is expected of me. Anyway, I hope that these insights might be helpful. I offer them in love and grace. I hope it came off that way. I am not asking for apologies or renewed attention, in the least...like I said, I feel that, overall, our support system is astounding! Thank you, Trisha! It means a lot to hear from you and receive your approval on how I stated my words. Dear Jenny, thank you for sharing your most personal feelings today. I have been thinking of you often, knowing the days are hard. I planted seeds for Vienne's birthday. I also planted a pot with seeeds and Ivy for both the girls. I am a trail guide at a horse ranch in Cle Elem. I found a sunny spot next to one of the horse enclosures and planted alot of seeds there. When they come up I will send pictures. I remember your blog about Vienne and her pony ride. May she look down see the horses and her flowers blooming. Thank you so much for your loving words. I LOVE LOVE that you planted seeds next to the horses! Oh, how she will LOVE that!! I think I had forgotten to mention that pony riding lessons were what we were planning to give Vienne for this 5th Birthday. Riding a horse was all she wanted last year. So, your plantings are very special to me. Thank you, Allie. I love hearing how you have been inspired to take more pictures of your daughter. So sweet to me. Thank you for this encouragement, Kristen. I wrote with some trepidation so it is good to hear validation for it. Thank you for your insights. I agree with your idea that you can truly relate to people who have been down your road and are a few steps ahead of you. No matter our path of grief, we can be helped, and help some one else. I'm sorry this is your path. I am heartened that you have so much support. Again, thank you for being so bold as to share your thoughts and lessons. You and Mark are on my mind, and in my heart so very often. I do hope that we get to meet and hug one day. Love to you! Thank you for posting this - especially the lessons for those who know someone who is grieving. I know I've been guilty of some of the things you point out. I even was when I met you and saw Mark at a wedding last year - and for that I am sorry. I had already read your blog and was keenly aware that even though I knew some of your story, I didn't know you. I should have acknowledged Vienne - especially to Mark who I did get to know years ago. Your words have taught me so much, and what has been surprising to me is that it isn't only because of what you have lost. It is because of the love you have for your daughters and the way that you treasure who they are. Your love for your girls shines through every post and you remind me to notice and cherish who my children are - in both the big and small ways. I do continue to pray for you and your family, and I am grateful that you have chosen to share so much of who you are here. Please no apologies. It was a wedding and I understand. I probably didn't even know that you knew our situation when I met you. It was a very overwhelming event for me. Thank you for your prayers and continued support. It means so much. Hope we can meet again sometime. Friend ~ Thank you for your words...always. This encouragement meant so much. I needed this validation that it was ok to write. I know that you think of V everyday - you are such a steadfast friend. I love you much. This post is great! Thanks Jenny! I wish I had read this post ages ago. I was one of those people who acted strange around grieving people. Your posts are so helpful to give us insight. You write so well and your are a true loving person. Your story has touched my heart and changed the way I approach my child and my life in general. Now, almost every night I just go into his room in the middle of the night and lie next to him while he is sleeping. I give him a kiss and cuddle him and then my heart breaks because I think of you and I wish you could still be able to cuddle Vienne. I feel grateful for you, because it is your words that make me cuddle my boy more often. I don't know you in person. And I only get to know Vienne through these posts. How interesting, you are worried about people forgetting her and here I am who only got to know her after she died. For me, I am only just getting to know her now. More and more, every time I read your post. The other day, I saw a little girl in the shopping centre and she looked just like Vienne. And I turned around. I haven't been the same since I read your story. I've grown a little pain in my heart. And it is there now constantly. The pain of not knowing where life takes us. Sometimes I imagine what would it be if something like that happened to me. Just the pure thought is unbearable. 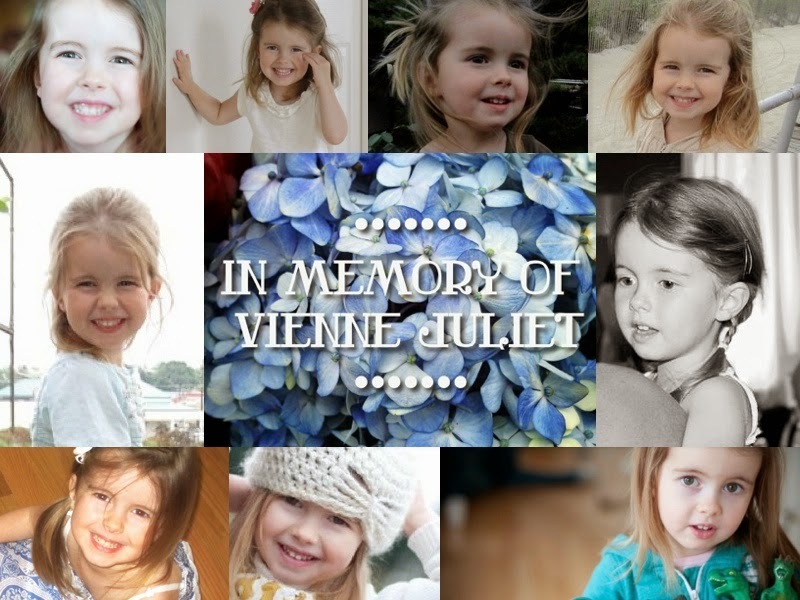 Vienne is not going to be forgotten. You are giving new life to her through these posts. Please write. Your words heal others and I think you are healing in the process too. And healing is not about getting rid of the pain. I don't know what healing is but I but I believe that feeling the pain is the integral part of healing. Wow, Be, this was such a beautiful heartfelt note to read this morning. Thank you for taking the time to share your heart with me. Your encouragement and compassion are such a huge gift. Thank you for entering in with me on this journey and being my new "friend". I will take ALL that I can get! You are warmly appreciated.